Early in the first term, I attended a workshop exploring the idea of “stuckness” in art practice. 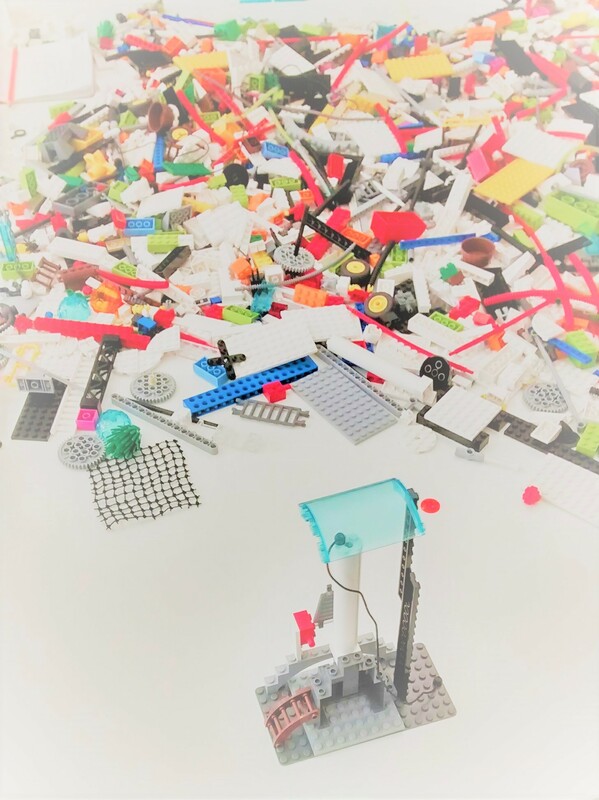 Six of us gathered around a large white table as the facilitator poured thousands of Lego pieces into the center. Yes, we were there to play with Lego! The procedure for this Lego Serious Play workshop goes something like this: Ask the question you want to consider. 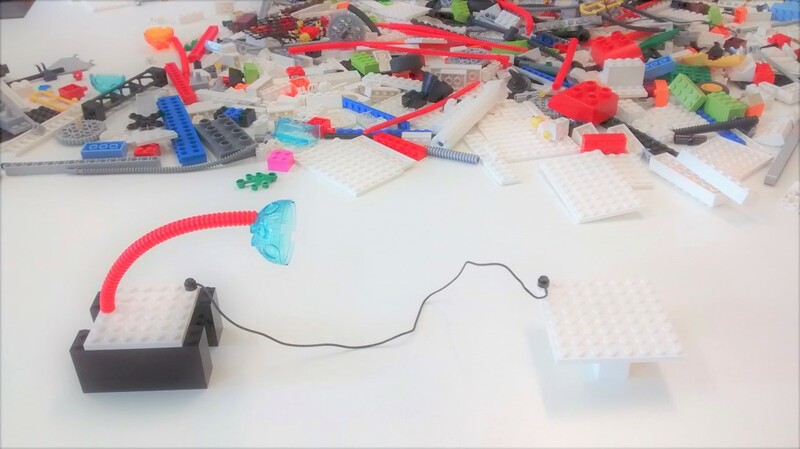 Think while building with Lego pieces—this should be play, like stream-of-consciousness construction (5-7 minutes). Share your construction with the group and what thoughts arise from it. Discuss observations more deeply with the group. 1. What is my creative practice? 2. What does stuckness feel like? 3. What role can stuckness have in my practice? 4. What conditions need to be in place to work with stuckness beneficially? After building this structure representing my art practice, the thought came that I tend to see my current practice as an ideal rather than what it really is. That my art practice takes shape more as a construct than a process. One would think my practice is accessible to me—it is mine after all—but it isn’t always. Perhaps I have placed the idea of what my practice should be atop a pedestal, shielded from worldly elements. It is protected but fragile, and my confidence in it can be easily tumbled. We talked about the importance of becoming aware of the relationship between my original intent or drive (my passion!) and the work I want to produce or the way I want my art practice to live. Imagine intention as a rhythm, a wave (some intentions have a longer life, like a long sine curve). 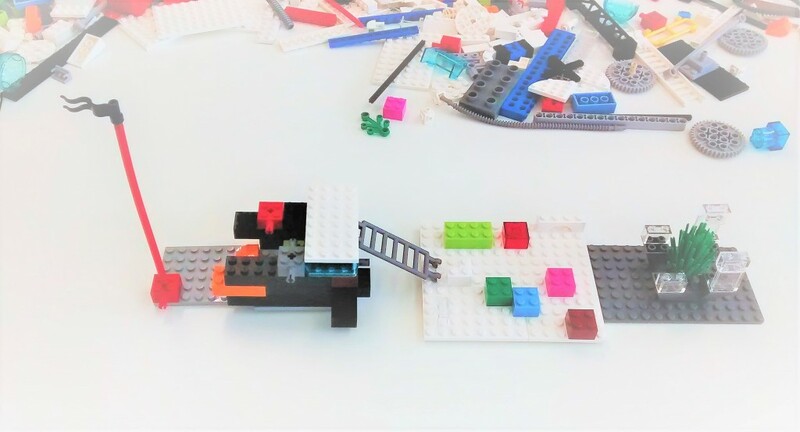 When feeling stuck, I can come back to my original intention by deconstructing that stuckness through another material, like a different art medium, an exhibition or museum visit, a walk—or playing with Legos. Inherent underlying knowledge will drive what I do and how I move forward or respond to stuckness. How does my discipline or practice (or material) drive my intention? Part of this process is about self-awareness and acceptance. Never berate myself for not doing what I think I should be doing, but take note of what I am doing, and be curious about it. Even in a situation where I’m not listening deeply to a person speaking to me, then notice why: What prompts me to engage or not in what that person is saying, or in what am are reading or doing? Take interest in those observations and what they could mean for how I shape my art (and life) practice. 2. What does stuckness feel like? and 3. What role can stuckness have in my practice? What happens when I get stuck? I have a distinct physical feeling, claustrophobic, paralyzing. My first reaction is to want to shut down, not push forward. To turn inward rather than push outward. The physical feeling of pausing to expand one’s chest with a deep breath is empowering, life-force giving. The inward curl of retreat physically and mentally alters my movement through the world, hindering it. My paralysis is related to my current perception to what being stuck means, the negative associations related to it, rather than what it might be pointing the way toward. This is something to be aware of. Building on this Lego piece (the left part of the image), we thought about how we can take note and move through stuckness: I can pay attention to the feelings of being stuck as a signpost or indicator that I am somewhere along a path—but that I am on a path, and ultimately I will climb through the stuckness to emerge in an open space that has been deconstructed and is ready for something new to unfold. Can stuckness be viewed as a practice? At the end of this 3-hour experiment, do I have a better sense of what conditions need to be in place to work with stuckness beneficially? A viewing platform is helpful. I need to step away from the focused interaction or engagement to get some breathing room and distance from the project or task I’ve been immersed in. I can use a different lens or materials to look at the work, to engage my intention—this has the effect of creating distance, a different type of viewing platform and a new perspective. And think about the body-mind, not just the mind. I can alter my perspective on my work and practice through something physical: Lego play, writing by hand, the materiality of walking, etc. Stuckness can be a practice. I think the key is to sit with it, don’t resist, and trust it is part of the journey that is leading you to new veins of creativity. I need to push through the negative associations with stuckness. What is the potential of stuckness? What are its generative or beneficial qualities? Think of stuckness as a springboard, using resistance as an opportunity for growth and self-development. Being stuck prompts questions that encourage creative growth. Being fully present with challenge is important. FLOW will happen when there is a balance between skill level and challenge.